NYC EDM festival Electric Zoo returns Labor Day Weekend, September 1-3, on Randall’s Island. This year’s festival is dubbed ‘Electric Zoo: The 6th Boro,’ and they’re announcing the Phase One lineup today in a Facebook Live video. UPDATE: Phase One lineup announced. 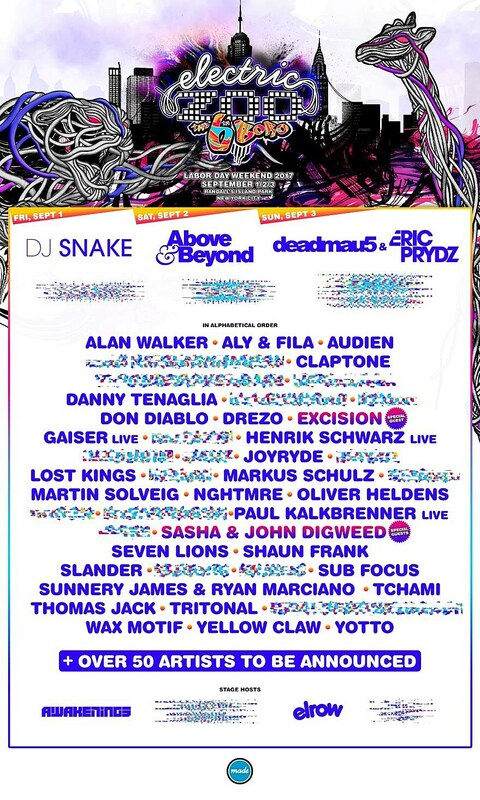 Headliners include DJ Snake, Above & Beyond, deadmau5 and Eric Prydz, and the lineup also includes Sasha & John Digweed, Excision, Tchami, Yellow Claw, Wax Motif, Joyride, Paul Kalkbrenner (live), Tritonal, Martin Solveig, and more. Full phase one lineup below. Over 50 acts are still TBA. deadmau5 is currently in the midst of a run of shows at NYC’s Hammerstein Ballroom that began last night (3/29) and continues through Saturday (4/1). On Friday (3/31), he’ll play a way smaller late-night Mau5trap party at Output on Friday (3/31) (10 PM doors). There’s also a deadmau5 pop-up shop at 157 W 24th St in NYC on Friday and Saturday from noon to 7 PM each day. The new Mau5trap compilation, We Are Friends, Vol. 6, is out now. Festival passes are on sale now.